LONDON--(BUSINESS WIRE)--Technavio has announced the release of their research report on the global sensitive toothpaste market for the forecast period 2019-2023. This sensitive toothpaste market analysis report segments the market by distribution channel (offline and online) and geography (APAC, Europe, MEA, North America, and South America). Global sensitive toothpaste market size will grow by USD 636.44 million during 2019-2023, at a CAGR of almost 5%. There is a growing demand for multifunctional toothpaste among oral health conscious end-users as it offers more benefits than conventional toothpaste. To cater to this growing demand, vendors are offering sensitive toothpaste with multiple benefits such as overall repair and protection and teeth whitening. For instance, Sensodyne True White toothpaste offered by Sensodyne protects teeth from dietary acid erosion as well as brightens them. The introduction of such multifunctional sensitive toothpaste is expected to fuel sensitive toothpaste market growth during the forecast period. Several end users increasingly prefer natural and organic oral care products because of the growing awareness of synthetic ingredients in oral care products. Natural and organic oral care products are made of peppermint, sea salts, arnica, coconut oil, and herbs and are free from toxic ingredients such as fluoride, triclosan, microbeads, parabens, and artificial sweeteners. With growing awareness of personal health and dental hygiene, the demand for such natural and organic oral care products will also increase. “The high penetration of oral hygiene products and the growing awareness of oral health disorders will drive sensitive toothpaste market growth in Europe. The rising number of patients with dental and oral disorders and the increasing adoption of technologically advanced oral care products will also have a positive impact on the growth of the market in Europe”, says an analyst at Technavio. To increase their sensitive toothpaste market share, manufacturers are adopting competitive strategies such as technological innovations and extension of product lines. Vendors are focusing on the development of innovative products based on new ingredients, functionality, pricing, flavors, and packaging. For instance, Sensodyne Repair and Protect Toothpaste developed the NovaMin technology which helps in providing protection against cavity by forming a protective layer over the sensitive areas of teeth. 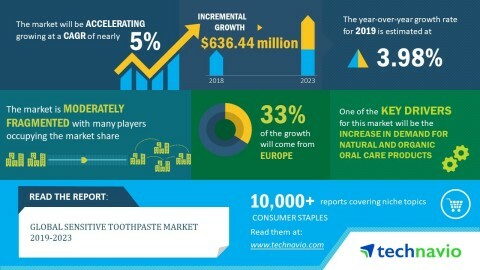 Technavio has announced the release of their research report on the global sensitive toothpaste market for the forecast period 2019-2023.